Welcome to Aphrodite, your Home in Greece, a modern and comfortable place of living which combines high quality specialized hosting and support services. The unit addresses to individuals of age 55 and more, who wish to visit or live in Greece. Our guests enjoy the famous Greek hospitality, the soothing weather, delicious and healthy Mediterranean cuisine, along with 24h services, throughout the year! The heart of Greece beats through the veins of its history. Greece and Christianity are two identical concepts. The abundance of the Greek land along with the life giving warmth of the sun are transformed into olive oil, the base of the Mediterranean diet. In Aphrodite we believe in the balance between your body and soul. Pleasant accommodation in modern and fully equipped rooms. Socialization, mental and physical well-being activities. Tailor made activities in the field of natural, cultural & religious heritage, enogastronomy, sports & leisure etc. via participation in local events, day trips and tours. In house health benefits and care services by our medical team, in case of need. Introduction into the Greek culture and folklore, by visiting archaeological sites, learning the Greek language, traditions and habits. Handling of external liabilities and affairs. In an ideal location, our 6.000 sq.m. facilities are in Saravali area , in the outskirts of Patras, Greece, with panoramic mountain and sea view. Patras is the western gate of mainland Greece, an international commercial center, a large port and a hub for trade and communication with Italy and the rest of Western Europe. The city lies at the western foothills of Mount Panachaiko overlooking the Gulf of Patra, an engulfment of the Ionian Sea. Just 4 km away from the city center, Aphrodite is a hideaway within walking distance of the pulse of the city, with direct access to a shopping center, public transportation, public and private hospital, bank etc. 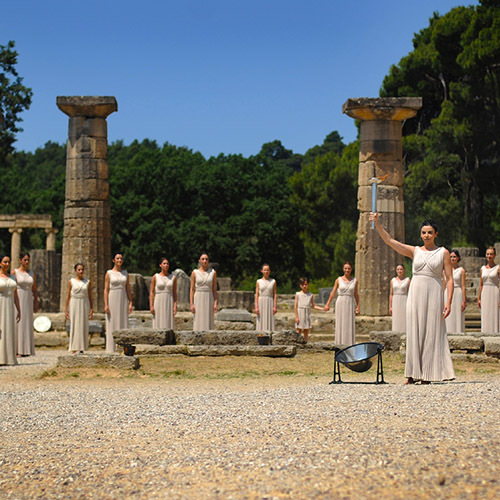 Located 220 km from Athens, 70 km from the town of Ancient Olympia, birthplace of the Olympic Games, and a number of historical monuments and attractions within a few kilometers, the location of Aphrodite is ideal for day trips and unrepeatable tours of historic and cultural character. The city airport is only 45 klms away, providing easy access to our premises. Browse our website for more information about the unit and our facilities or contact us at info@aphroditi.com.gr . We will be glad to accommodate you and meet you in person!